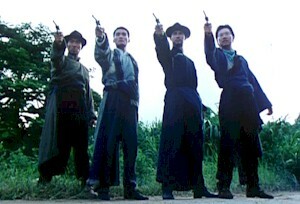 The Skinny: Excellent period action film from Kirk Wong and Tsui Hark. While a bit muddled plotwise, the film compensates with terrific action and some moments that pack an emotional wallop. Basically a Chinese version of The Untouchables, this actioner from Tsui Hark and Kirk Wong is a well-crafted period genre movie. Tony Leung Ka-Fai is Ding Chun-Bee, an honorable cop in turbulent 1930’s Shanghai. He’s a rare righteous cop that belongs to police force comprised of mostly corrupt officers, though their no-nonsense captain (Tsui Kam-Kong) is honest. Ding finds himself locked in a rivalry with opium smuggler Haye (Adam Cheng), who happens to be the same Chinese officer who tortured he and his pals back during wartime. Ding takes out Haye’s Uncle Liang in a raid leading to a vow of vengeance by Haye. Ding has his own score to settle because Haye offed his partner. Since the cops are no help, he looks elsewhereand finds this three old war buddies (Mark Cheng, Waise Lee, and John Woo’s film editor, David Ng).